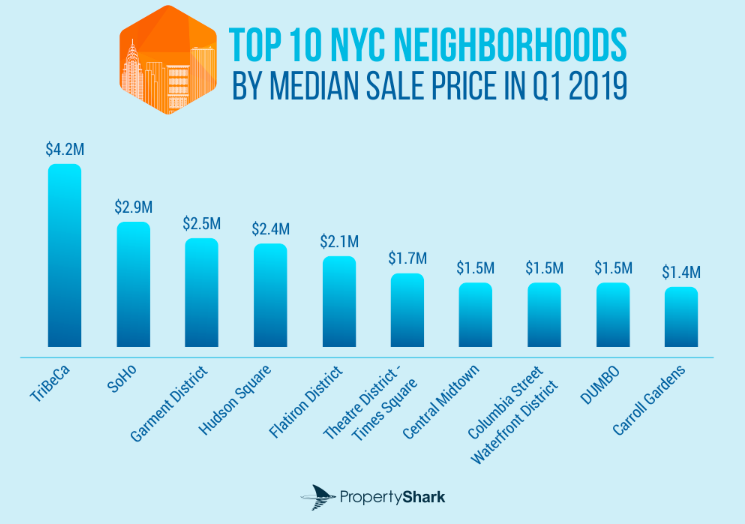 Real estate blog PropertyShark recently released its first quarter (January 1 – March 31, 2019) report of NYC’s 50 priciest neighborhoods with top-ten regular DUMBO being joined by the Columbia Street Waterfront District and Carroll Gardens. As usual, Tribeca came in at the #1 spot with a median home sale price of $4.2M and Soho in second place at $2.9M. Manhattan’s Garment District took third place with a median sale price of $2.5M. 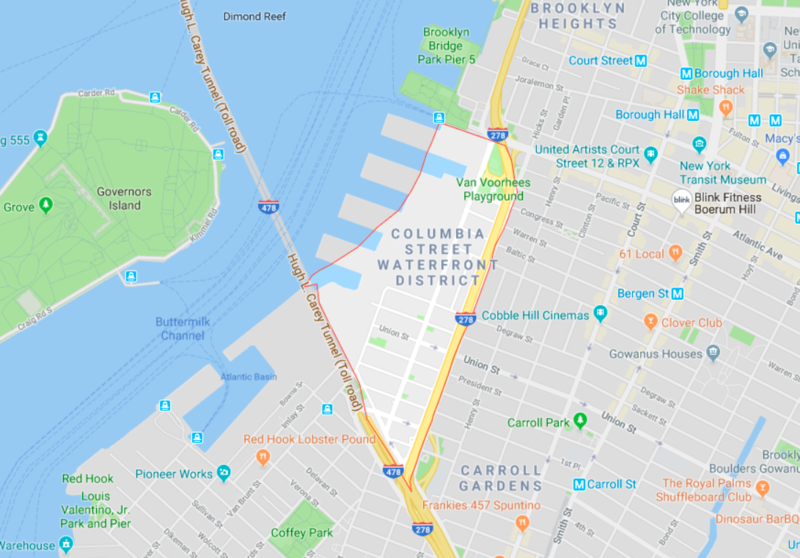 Brooklyn’s top entry at #8 is the Columbia Street Waterfront District, with a $1.49M median home sale price, just edging out #9 on the list, DUMBO, with a $1.48M median sale price—a 25% decrease from last year. DUMBO came in at fifth place on the 2018 list and was the only Brooklyn neighborhood to make the top ten last year. A group of Columbia Street Waterfront District neighbors recently won a battle against a developer who planned to upzone 41 Summit Street and two adjacent sites on Hamilton Avenue. 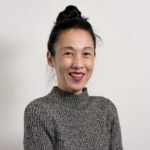 The owner of 41 Summit withdrew the ULURP application earlier this month after the neighborhood group, Community Board 6, Brooklyn Borough President Eric Adams, and Council Member Brad Lander voiced opposition to the plan to potentially erect buildings twice as tall as existing homes in the low-rise neighborhood with little public benefit. Carroll Gardens rounds out this year’s top ten with a $1.4M median sale price, an 8% increase from last year. The neighborhood came in at #13 in 2018 with a $1.314M median sale price. Manhattan Beach took the #14 spot, with a median home sale price of $1.29M, an increase of 35% from last year, boosting the Brooklyn neighborhood up from its #30 ranking in 2018. Manhattan had 22 total entries in the top 50 list with Brooklyn second at 21 spots. See below for the other 17 Brooklyn neighborhoods on the list. Check out PropertyShark for the full list of NYC’s 50 priciest neighborhoods (Q1 2019). I’m sure the Columbia Street Waterfront District is very pretty these days but it will probably be the Columbia Street Underwaterfront District in a couple of decades.